Whether you like her or not, there is no denying Madonna's staying power and her imaginative capacity to continuously reinvent herself. With her 2000 album titled "Music", she once again demonstrated the constantly changing dynamic of both her music and her image. 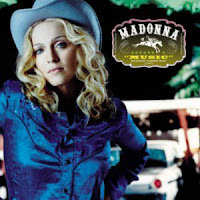 This was Madonna's 14th album and its title track, "Music", her 10th number one single in the UK, making Madonna the first female artist to achieve this landmark. The most prominent difference between "Music" and Madonna's previous albums was that she had written all but one of the 11 tracks herself. Recorded over an eight-month period, the album was a result of experimentation between Madonna and the French songwriter, producer and remixer - Mirwais Ahmandzai. Ahmandzai's task was to experiment with Madonna's voice, reinventing it with electronic effects and contrasting these new sounds with Madonna's natural, pure voice. Madonna has always been at the forefront of change, courageously delivering something pioneering to her fans - despite the risk of losing those who liked what she delivered before. Those who thrive on this quality will not be disappointed. This album is different. It is an eclectic mix of what seems to be an honest expression by Madonna herself. The album contains fun dance mixes contrasted with slower, more introspective ballads. The dance tracks are extremely catchy and like so many of Madonna's hits they stay in your head - making sure you're still singing them long after the music has stopped. The CD's title track "Music" starts and sets the dance mood immediately. All of the faster tracks like "Amazing" and "Runaway Lover" are also dance tracks characterized by upbeat tempos, instrumental mixes and electronic effects on Madonna's voice. The slower tracks like "What It Feels Like For a Girl" and "Nobody's Perfect" reflect a softer, more feminine Madonna and both lyrics and music discuss Madonna's thoughts and feelings - almost a subtle observation of the world around her. In fact, this seems to be an apt description of the album as a whole. It is subtle and interesting, and coming from a woman who is arguably the biggest and strongest force in her field, this subtlety reflects a softness and melancholy in Madonna's creative spirit. This album will certainly appeal to fans who thrive on her ability to surprise. For those who are not necessarily fans of Madonna's past experiments - take a listen - the album may reflect a side of her that appeals to you.